Which solar developers are active in the Republic of Ireland today, and which ones will ultimately be successful when the market takes off? This is perhaps the question we are getting asked the most at Solar Media, with expectations building ahead of the government announcing its policy framework for solar PV deployment within the next few months. At this early stage in the market, it is challenging to know exactly which companies will emerge as the most successful. To help understand this, we can nonetheless analyse the background of the developers, and what business models they have used in the past to take sites through from planning to completion. Our internal research at Solar Media has indentified four main categories for companies developing solar projects in Ireland at the moment: solar developers with experience in the UK; those with experience from other European markets; wind developers with experience in Ireland; and companies with no previous renewables experience that may either be landowners or merely looking to get into solar from an opportunistic standpoint. 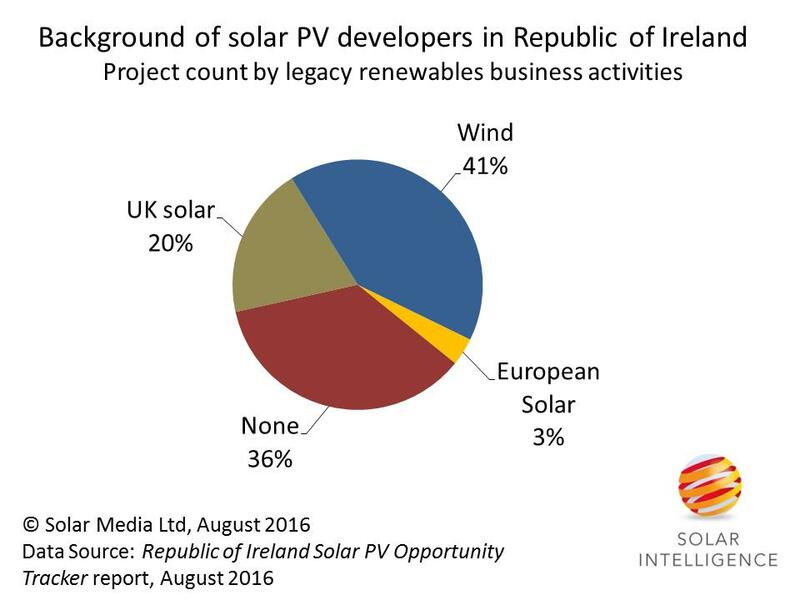 Only 20% of the developers active in planning applications in the Republic of Ireland have a background in developing solar sites in the UK, with wind developers accounting for the largest number of companies active today. Recently, there has been considerable interest from solar companies looking to move from the UK to Ireland, but so far only a few have submited their own planning applications. Indeed, only one of the top five developers - in terms of number of projects - has previous experience in the UK solar market. In part, this is probably due to timing; grid applications for solar projects in Ireland began to be submitted in early 2015, at a time when the UK market was heavily engaged in building out large-scale ROC projects. However, some of the leading developers from UK solar have strong associations with Ireland or are headquartered there. This would appear to have been a key factor determining which developers decided to enter the Ireland market early. Going forward, we are likely to see other developers entering the market from March 2017, after the RO deadline for 1.2 ROCs in the UK has expired, but these companies may be looking for different market-entry routes other than greenfield site identification. By this time, they will also be joining the end of a 500-project-plus queue for grid connections amassed in Ireland over the last two years. Typically, the solar companies that have already moved from the UK to Ireland are highly experienced in developing solar projects through to completion, and then either retaining ownership or selling on as an operating asset through the secondary market. It appears that many companies are looking to follow a similar pattern in Ireland and should therefore be able to use existing relationships for EPCs, sub-contractors and component supply. Today, there is around 2.4 GW of wind installed in Ireland, suggesting there are many project developers in place that already have experience working within the existing landscape for renewables projects. Therefore, it is perhaps not surprising that more than 40% of solar developers active in Ireland have experience developing wind projects. Historically, wind developers have had limited success in switching to solar projects. However, there are many similarities in the planning process that should ultimately help these companies. While the early development stages are similar for solar and wind sites, once any (auction) bidding and construction phases begin, it is likely that many will seek to find new partnerships and approaches to see sites through to completion. Alternatively they may prefer to get projects fully permitted (to a shovel ready state) and then sell them to other developers to see through to build-out. There is also a small group of companies that has previous experience developing solar projects in other European countries, but was absent from the UK when the market started there back in 2011. These companies likely made a decision not to enter the UK market, viewing it as overcrowded and suffering from policy uncertainty, or were simply not in a financial position to allocate the up-front costs associated with the early planning processes. Most of these companies are actually headquartered in Ireland, so were ideally placed to get an early view of their domestic market and the expected timelines involved to drive initial planning applications. The final group of developers active in Ireland - comprising more than 35% of the developers active today - are largely unknown from a historical wind/solar deployment perspective. This group is largely a collection of newly formed companies (or SPVs), land owners, and developers from other sectors. Some of these newly formed companies are essentially energy industry experts (or indeed individual businessmen), with a background in the renewables energy sector as a whole. Although the companies (or SPVs) used for the planning process may appear to be new, there are familiar faces that crop up on more than one occassion. These companies typically have multiple solar planning applications pending and were among the first to act in Ireland, being unencumbered by competing business activities or solar projects in the UK that required bandwidth to see through to completion. Having made significant investments early into the Ireland solar market, it remains to be seen how long these companies will have to wait until their investments will see a tangible return. While the preferred route of these developers may well be to build out projects themselves (if they can secure finance), the prospect of selling consented sites pre-construction cannot be overuled. Within this group of companies are various landowners who have put in applications for projects on their own land. Some of these projects may not make it through the permitting stages however, and it is likely that the ones that are successful (unless they can secure financing) will look to involve an experienced solar developer to take the project through to completion. As with any solar market in the early stages of development, there remain many unanswered questions, and a key factor in deciding which projects are successful will be dictated by the timelines for announcing and implementing policy support. Submitting grid and planning applications is a major finanical commitment, and there may be several companies that having submitted applications that are unable to sit on this outlay for an appreciable time. Ultimately, this will likely remove some of the more speculative projects that are unlikely to be built going forward. With so much pre-market jostling at the project planning stages, it is likely that many of the projects that are expected to come to fruition under the pending Ireland solar market are already at some stage of early development. In this respect, it is almost essential that supporting companies, such as EPCs and module/inverter suppliers, act now to understand which companies and sites need to be prioritised for sales prospects lists in the future. To help understand the market in general, and to provide direct contact with the key stakeholders in Ireland, Solar Media is holding the first major solar conference in the Republic of Ireland later this year, Solar PV Ireland, from 15-17 November 2016 in Dublin. We have also released our new Republic of Ireland Solar Market Entry report as the definitive guide to companies looking to benefit from solar activity in the country from 2017 onwards. Details on how to order this report can be found here, or by emailing us directly.